This is one of the great water in Niigata pre, called ”Yashimizu“. It’s 34 ℃ today. However, Taiwan is hotter, Japan is also hot. I couldn’t help washing my face! So cool, refreshing. It’s like heaven! After refreshing, departing to Beechforest! But as matter of fact, it is not true. I searched the internet. 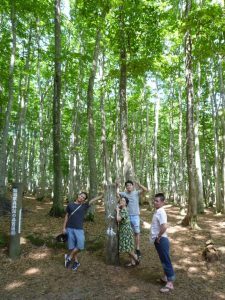 It says the beech trees grow very straight and the shape is beautiful. 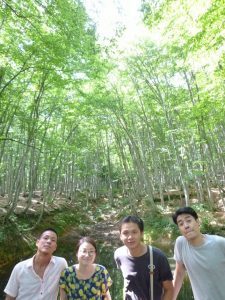 That’s why it’s called beautiful forest in Japanese. The beech stand really straight. I wanted to stay here for a day as I needed rest in shadow, it’s too hot outside. 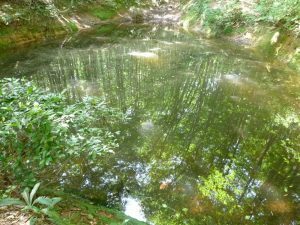 There is a little lake in beech forest when you take a photo of it, the lake reflects beech. The photo will be amazing! I recommend here for a photographer because you will take an interesting photo here. 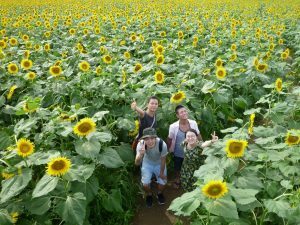 After forest, we head to a sunflower park. 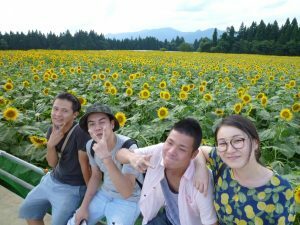 Sunflower Park is in Tsunan village next to Tokamachi city. I expected just like a little bit park, but it is the huge park! I can’t see the end line of this park. You can enjoy maize in sunflower park. This park is maize itself. The maize snacked very much. So we took 15mins to finish! I’ve never been surrounded by sunflowers. This photo is before the finish line. 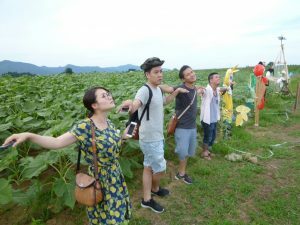 Scarecrows make a line in front of sunflower. So we pretend them. So We went to gelato shop which is famous for good taste gelato using fruits or vegetables. They start this shop this April. An owner is a good man. He started this shop because he wanted children to smile. 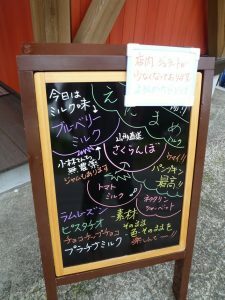 In front of the store, there was handwriting menu. Every word was written in Japanese, so Aki translated for us. Half of menu are already sold-out when we arrived there, as they are very popular. Need to come earlier next time! The best and surprising gelato is “Edamame milk” taste. Edamame is green soybeans. Although this is gelato, you feel real Edamame taste and flavor. So nice flavor! If you like edamame, you should try! I’m sure you will like it! 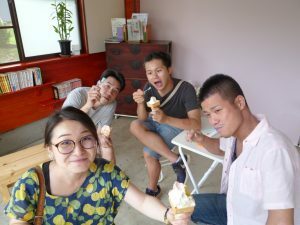 The shop offers different taste gelato every day. So when you come here next time, what kind of gelato are waiting for you? It will surprise you! At that night, we stayed Japanese old traditional house, called Guildhouse. It started 2 years ago, but more than 5,000 people have come there. 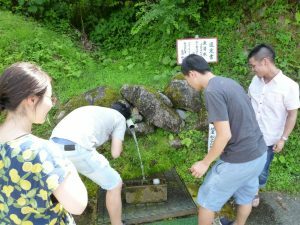 5,000 people are not only Japanese but also people from other countries. This is the old house. However it is not clean, you feel like warm and cozy atmosphere. When we stayed there a lot of people are there. They are not good at speaking English, but we could communicate each other. I probably understand why so many people come here. Though this is not my home reality, I could feel my home. So I can say my second house. We were exhausted yesterday, slept tight. We were planning to Tokyo that afternoon. We looked around just morning! 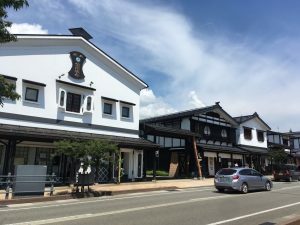 Bokushi street was restored and presented in mostly their original form from its most prominent era in Edo period. Edo period is about 400 years ago. It is just time Taiwan history starts. OMG! Only this street is Edo period style around here. When you come here, you should say Wow! The left white building is a bank. When I walked through this street, I felt I was Japanese! Edo era is Samurai period. Sitting on a bench if I imagine how they look like, I can feel them. My friend Fone pretend Edo period people. Chaaaaaan! After that to go Tokyo, we head to Echigo Yuzawa station. 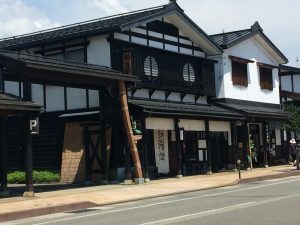 In the station, there is Sake museum! 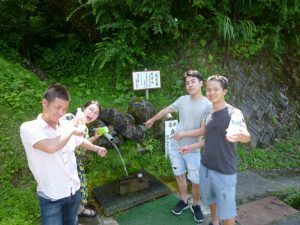 I know Niigata is famous for sake. But I didn’t expect such a museum in a station! We can try sake tasting very reasonable cost and it looks like vending machine. We took a short movie. Check it out! 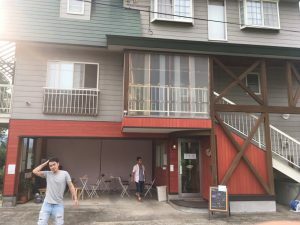 When you come to Echigo Yuzawa station, you must try! This is the first time to come to Tokamachi. 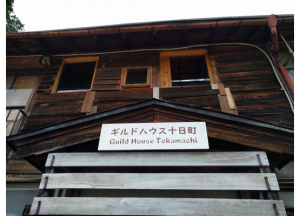 I didn’t know Tokamachi is such a rich nature and artistic city at all. 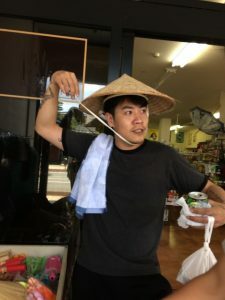 Food is good! Air is good! An artwork is good! A photographer must like it! Tokamachi is not famous at all even though so good place. I want my friend to tell about Tokamachi! See you next time Aki!